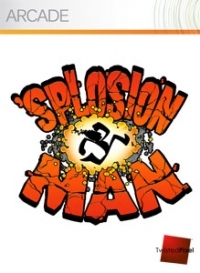 Box Text: Unlock Splosion Man, one of the most awesome games of all time. The full version of Splosion Man includes an unlockable premium dashboard theme, free gamerpics, and even avatar accessories! You’ve sploded the rest, now splode the best. Splosion Man has a fifty level single-player campaign and a separate fifty level multiplayer cooperative campaign. 10-20-2011 scott Box Text Unlock Splosion Man, one of the most awesome games of all time. The full version of Splosion Man includes an unlockable premium dashboard theme, free gamerpics, and even avatar accessories! You’ve sploded the rest, now splode the best. Splosion Man has a fifty level single-player campaign and a separate fifty level multiplayer cooperative campaign. This is a list of VGCollect users who have 'Splosion Man in their Collection. This is a list of VGCollect users who have 'Splosion Man in their Sell List. This is a list of VGCollect users who have 'Splosion Man in their Wish List.